Use this chart to determine your child's age group. $10 Tryout Fee per player. If registering multiple players, please fill out the form multiple times. Are you registering a second (or more) player? If you have filled out the entire form for your first child, you can skip some information. No, I am filling this form out for the first time. Yes, I have filled out the entire form for one player and I'm registering multiple players. What school does this player attend? By digitally signing, I agree to fully discharge and do forever release, acquit, discharge Keiki Opio Volleyball Academy (KOVA) or practice facility owners, and it's officers, agents, servants, employees, and organizers from injuries, including death, damage, or loss which my child may accrue on account of participation. I herby authorize the personnel of Keiki Opio Volleyball Academy to take any necessary steps for the required medical treatment for said child/ward. 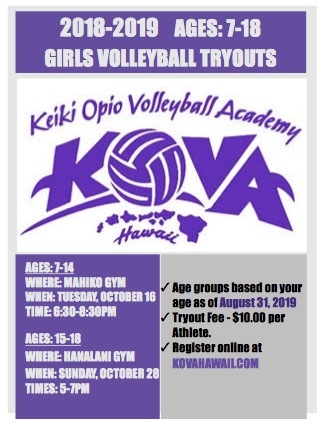 I hereby forever release, Keiki Opio Volleyball Academy from any and all liability for any medical or dental treatment decision made for the treatment of the child/ward. I also give Keiki Opio Volleyball Academy to take photos and video of my child for promotional, educational, news, and public purpose only in print and/or electronic media. It is my responsibility to notify the Keiki Opio Volleyball Academy in writing if I do not wish to have my child photographed or videotaped. Please list all medical conditions and allergies. Please fill in your full name as your digital signature. Please give us some contact information in case we need to get a hold of you.